Finally done with the skins and leaving for work in the city very soon. Did some crafts in the evenings in between the skinning of legs. On the first picture, from left to right: A new buckskin sling with bone bead for the grip. 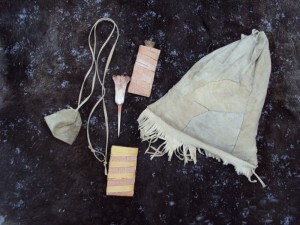 Two birch bark sheaths for awls. The awl out of the sheath is also new. I find narrow and long ones best for fur and shorter, sturdier ones better for buckskin. The bag is made out of scraps of buckskin I have had laying around for ages. I am experimenting with some new tanning methods (not completely successful yet). The left tool is an unmodified jaw bone of moose where the teeth are used to pull the hide soft. The rib to the right has been serrated to perform the same task, which it does, but not to the same extent. Next is a hafted, bone stretching tool, with serrated teeth, stretches the skin and pulls off remaining membrane. To the right is a broom I had to make in a hurry. Could have been prettier and more well done. 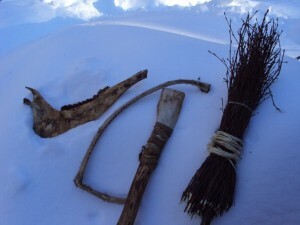 Birch twigs bound with a birch withie and a piece of sinew higher up.